DRS was first introduced into motorsport through Formula 1 in 2011, the system has rapidly spread through other forms of motorsport as a way of increasing the overtaking opportunities and making cars more efficient in straight lines, using less fuel, saving tyre wear etc. What are the actual effects of DRS in terms of Down Force and Drag on the cars themselves though? At the Mexico GP in 2015 the Formula 1 cars reached speeds in excess of 200mph and at those speeds the cars are supposed to be able to create more downforce than the car weighs itself. 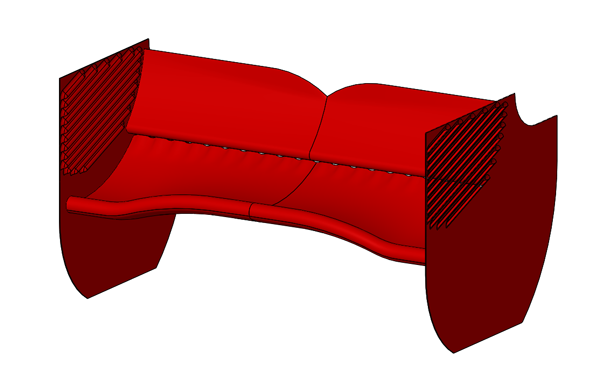 With SOLIDWORKS Flow Simulation we can find out what those effects are. The angle at which the wing opens when DRS is enabled as 50 degrees. Two configurations can be made from one assembly, by rotating the upper element of the rear wing and angling it in an upward direction of 50 degrees we can emulate the mechanism of the DRS being enabled. Because two studies need to be ran and the type of flow will be external, a computational domain must be created around the assembly and must be kept constant between the different studies. Keeping those constant will allow data to be compared accurately. Air needs to be added to the studies and a velocity with a direction for that air flow to simulate the movement of the car, in this case the velocity was in the –Z direction at 200mph to simulate the car moving in the Z direction. Inserting global goals will track the Down Force and Drag level, using the Normal Forces Y and Z they will be able to give those values for the whole study. Below are two images showing the results of the studies after being ran and showing cut plots though the centres of each one. On show are the velocity plots, they differ quite a bit. At this point we can now look at the Down Force and Drag levels of each study. This is taken from the global goals. The force in Y will show the Down Force and the Force in Z will show the Drag force acting on the wing. The values come in Newton’s but can be converted into Kilogram Force. The values should also be a minus value because of the orientation of the assembly in regards to the XYZ coordinates. When DRS is disabled the wing produces 599.6kg.f of Down Force and 337kg.f of Drag, but when the DRS is enabled the wing only produces 249.7kg.f of Down force and 102.7kg.f of Drag. This is a 58% decrease in Down Force and a 69% decrease in Drag when the DRS is enabled at 200mph. This makes it easy to see why the drivers can create more overtaking opportunities when the aerodynamic package can reduce drag by this much.